Life with the brace has had its ups and downs. All in all, I’m more happy with it than I was the fixator and certainly happier with it than the cast. Drew has a lot more freedom now being able to sit up and use his wheelchair again. However, his brace has required many adjustments in order to fit right and I still don’t think it’s quite right. After having the brace fit on Wednesday last week, it was a dream compared to living with that cast. On Friday, Dr. Paley wanted to see Drew in the brace to confirm it suited his needs. After several x-rays, Dr. Paley took one look and noted that Drew’s heel wasn’t properly placed into the foot cup (it was squeezing its way through the space between the foot cup and the calf portion of the brace.) So, off to Jupiter we went to visit the brace man. I was pretty sure that I had placed the brace on wrong as it’s a very awkward piece of equipment to deal with all by one’s self with all of the pads, velcro, and getting it lined up just right seems an impossible feat. But, the brace man-made a few adjustments and all seemed well. Then, it was off to pick Daddy up at the airport. We’ve been at the airport so often that Drew knew precisely where to go. 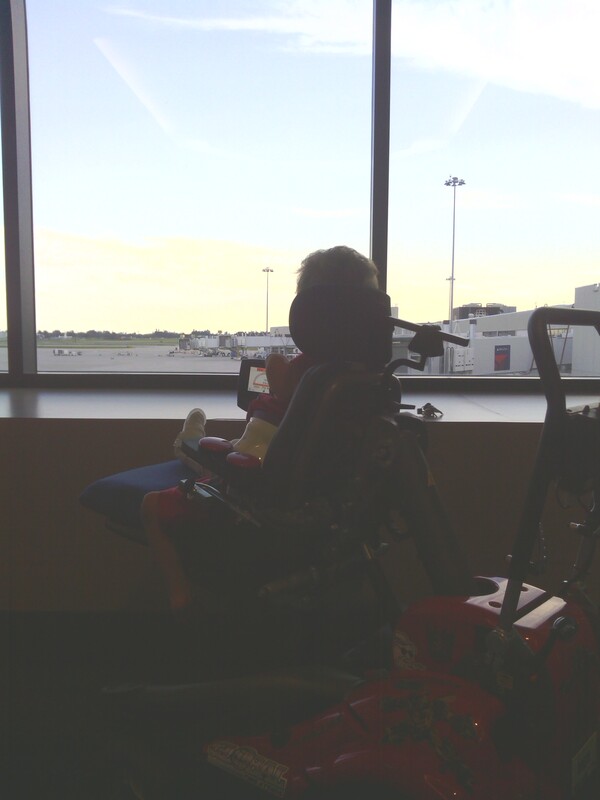 And, he drove his chair to his favorite spot: the window out looking the tarmac waiting for Daddy’s plane to land. As Daddy walked down the hallway to meet us, Drew hollered “Daddy! Daddy! I missed you sooooo much!” Maybe it was because I was so stressed out from a difficult week or maybe I was happy to see Drew so excited, but I choked up a little. Every time. There is nothing like watching your husband and Drew’s daddy come give us a big hug after being away for so long. And, I say “so long” with all the respect in the world for military families who deal without their loved ones for far longer in areas in which their lives are in constant danger. I get chills thinking about it so hats off to you military families. Thank you! Dr. Paley wanted to see Drew again after having his brace readjusted so luckily Nathan was finally home to do all of this running around. I was starting to feel guilty for all of my time away from work. Dr. Paley still didn’t think the brace was correct so Nathan had to take Drew again. In fact, Drew has developed a dark bruise on his heel from being trapped in that space in his brace. It’s quite painful to the touch and it’s a forbidden area. This time, the “brace man”, as Drew calls him, decided to keep his brace overnight and make some additional adjustments to try to get it to fit right on his foot. Since Drew wouldn’t have his brace for a day, Nathan took him swimming. And, I got to hold him on my hip like a normal child not undergoing painful leg surgery. It was just me and him. No metal. No plaster. No velcro. No plastic. Just him cuddled up in my arm and I haven’t felt physically closer to him since May. I didn’t care how heavy he was. It was so nice holding him so closely with nothing between us. I miss those days so much sometimes. So, next day we all went back to the brace man’s office to fit his brace again. Getting the brace on and off is always the most difficult part. It’s painful for Drew. He cries. It’s awkward so I’m sure we aren’t doing anything but exacerbating the pain. But, this time was especially difficult emotionally. Because Drew had gone about a day without the brace, having to straighten his leg in order to lock the brace at the knee was difficult. It was a little tight and it didn’t take long for Drew to enjoy life without the brace. 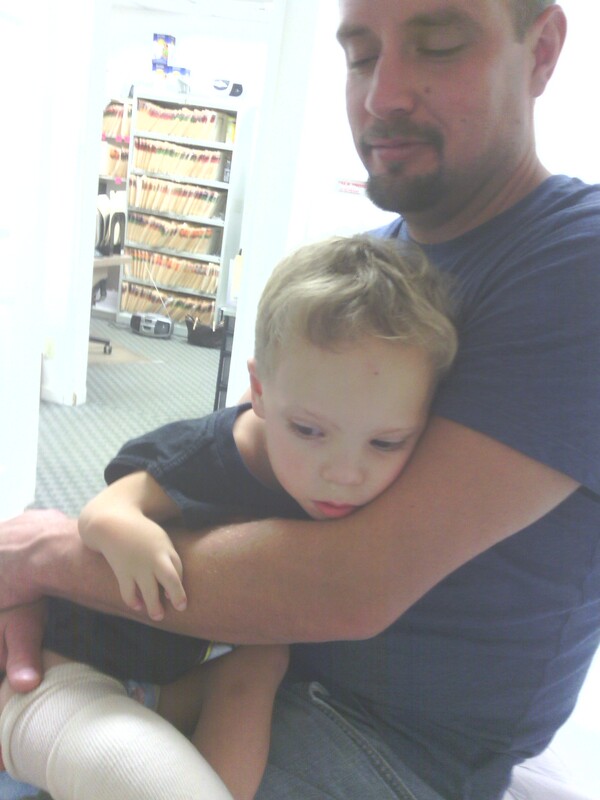 Since May, Drew has been having more than his fair share of pain, but this experience was one of the top five worst. He was choking up and inconsolable. Nathan and I looked at each other in desperation. It feels like we are just torturing our child. He begged us – and, I mean BEGGED us – to take the brace off. We could just tell by looking at him the pain was unbearable. And, we just had to watch it. We would try to hug him or hold him close, but he’d just squirm right out of our grasp. No amount of love, words, or anything would help him feel better. It’s just indescribable having to sit there witnessing your son in so much pain that he can barely control his breathing. Just imagine putting a brace on your leg that forced your knee to bend in an opposite angle slightly more than it naturally wants to sit. Have you ever injured your knee by twisting it the wrong way slightly? It hurts like an M-and-F-er. Now imagine having your knee flexed in that position permanently. This is THE hardest thing I’ve ever had to do. He suffered almost all the way home, eventually crying himself to sleep and occasionally waking to cry. Today is better though. He has taken pain medicine today, but I’m not watching my beloved son suffer the torture of his brace. He even slept better last night than he has in a long time. (Though, I will admit, that we slightly exceeded his pain medicine dosage in a desperate attempt to make some of the pain go away.) He took a bath today and after the bath he knew it was time to replace the brace. He knows how difficult it’s going to be so he had already started to whine about it. Putting the brace on is sort of two-person deal. The brace has these pads with velcro on top so as you are placing him into the bottom portion of his brace, you must have an extra hand to pull the pads out from underneath his leg so they’ll sit on top all the while you are holding him up and trying to line his leg up with it just perfectly. Nathan asked, “How in the world are you going to do this by yourself?” With a heavy sigh, I said, “I’ll have to make it work. But one thing is for sure, he won’t be taking a bath everyday!” So, Drew was, of course, screaming the whole time. His ankle and his knee seem to be the cause of all of his pain so we have to be really careful around those areas. We got his leg placed into the brace and we were satisfied with its alignment. Now, it’s time to lock the brace at the knee and we all know how painful this is so we always approach this with the ultimate care and compassion. I slowly pushed down on his knee and pushed up on his calf and locked the brace. In the midst of loud sobs, Drew hollers, “THAT WASN’T SO BAD!” Both Nathan and I chuckled. You have to imagine Drew saying this at the top of his lungs following loud sobbing and it was followed by additional loud sobbing. That poor child. But, I’m happy to report he recovered within 10 minutes and he’s back to his normal happy self playing video games with Daddy. We have to see Dr. Paley again today so he can confirm that the brace is finally fit right. I hate to say it, but we’ve seen his heel come out into that space STILL. I just overheard Nathan telling Drew, “Stop pulling your foot up! If you keep doing that we are going to have to go get your brace fixed again!” So, we’ll see what Dr. Paley says. I can look at his foot and the foot cup and see that there is about a .5 inch of space between his foot and the bottom of the cup but I kinda hope that Dr. Paley says that’s fine. I want his brace to be fit properly, but I absolutely hate HaTe HATE creating pain for Drew. 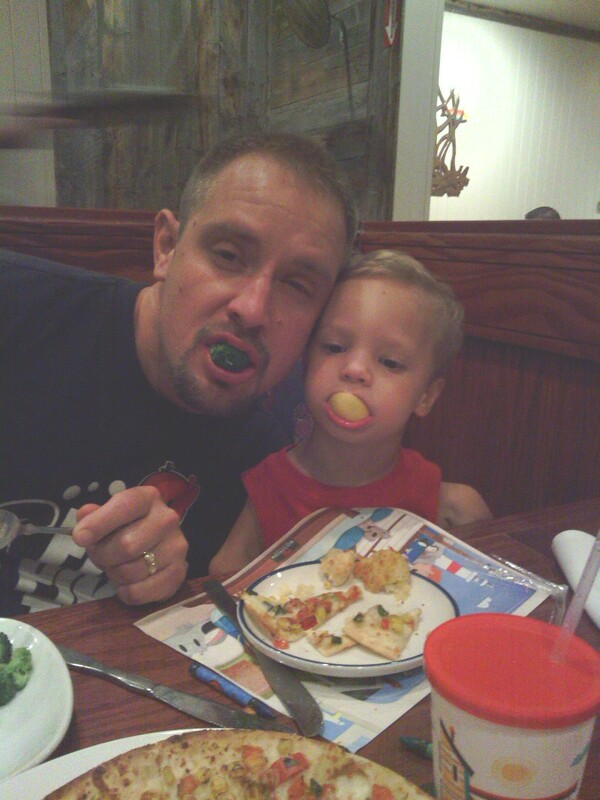 Btw….did you hear about my other blog I just started: www.babyinthebalance.wordpress.com. Big news!